Yes, it is fall, and yes, the outdoors are beautiful right now. I'll leave it to the more poetic minds out there to wax about the season, because they probably don't have loud toddler chatter as distracting background noise. It really makes contemplation and the conjuring of lyrical prose difficult achievements. Suffice it to say, we are enjoying this momentary jolt of warm weather with afternoon swims, airy sun dresses, walks under the canopy of fiery leaves and primal displays of enthusiasm via interpretive dance on our front lawn. Look at that, I can be slightly poetic amidst the cacophony of little girl shrieks. We went for a short walk, all the little girls on foot, to a neighbour with a giant pine tree down the street. They collected big, open pine cones in little buckets. 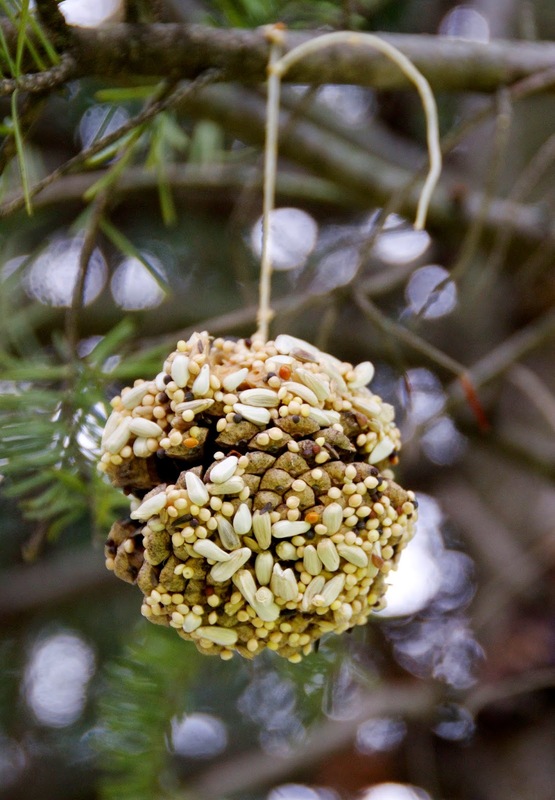 At home, we spread a peanut butter-oat mixture all over the pine cones, tied string to the tops, and rolled them in birdseed. 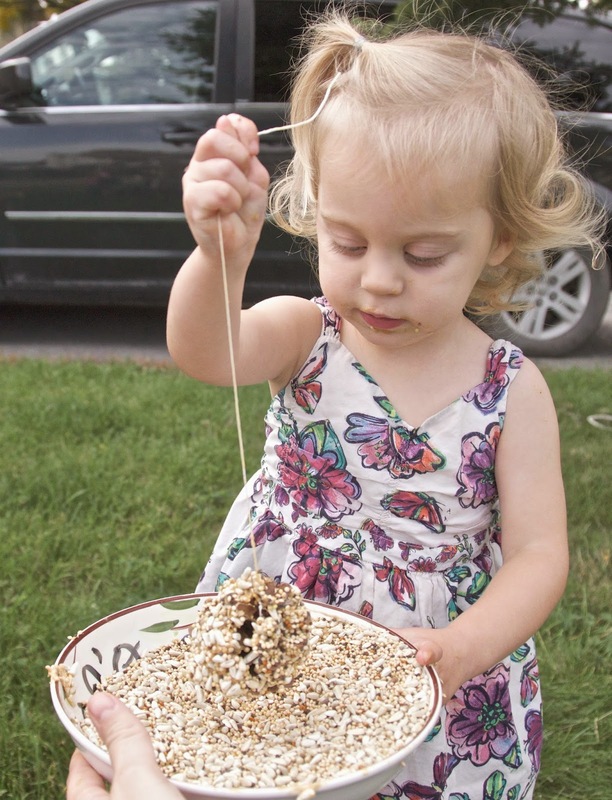 This process was messy, involved several reminders not to eat the birdseed (before my resolve was thinned and I just let them eat birdseed), and, the best part: proud little grins. It was messy. 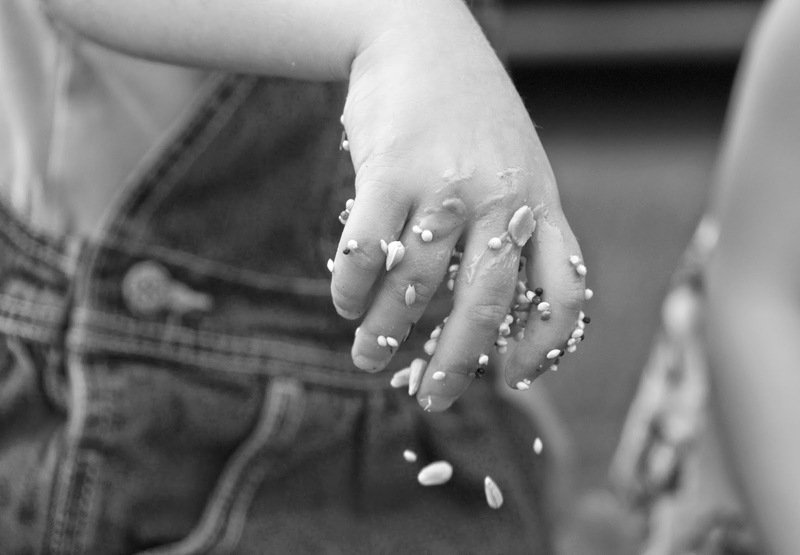 Many seeds were eaten. We all walked out front after lunch in our bare feet to check on our pine cones and see if any birds had found our treats. A squirrel had taken one away, but the rest still hang. I posted Skylar under the tree this afternoon to guard our fir tree from rodent intruders. My recent decision to pare down our level of busy-ness came in good time. I had forgotten how many needs our home has this time of year. This weekend there was a garden to cut back, logs to pile for firewood, and family dinners to prepare. It felt really productive to perform sweaty, hard work with immediate and visible benefits. Abby helped me finish cutting back the hydrangea and plant some tulip bulbs for next spring. The little girls contributed their pine cone bird feeders, to help our bird neighbours fatten up for winter. Rich helped dig up some ugly, brown-flowering bushes to make way for berry bushes next year. 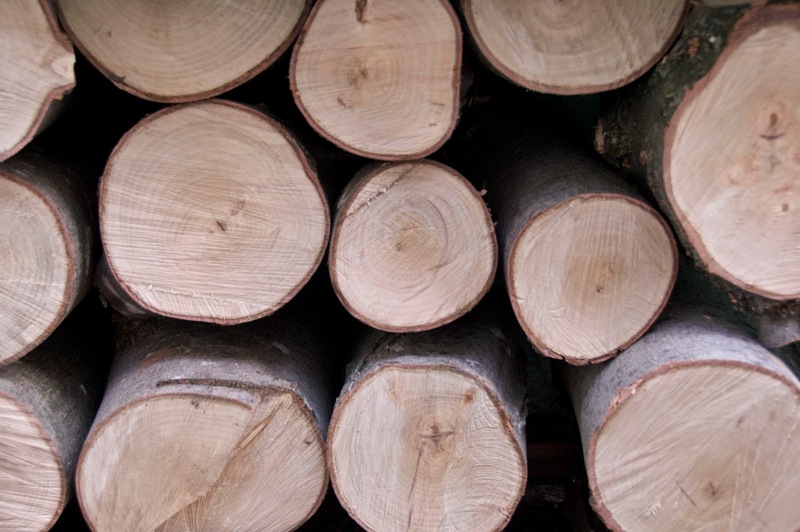 He also transported and piled maple logs from my mom's (former) tree. The maple's roots had been damaged and the tree was dying. 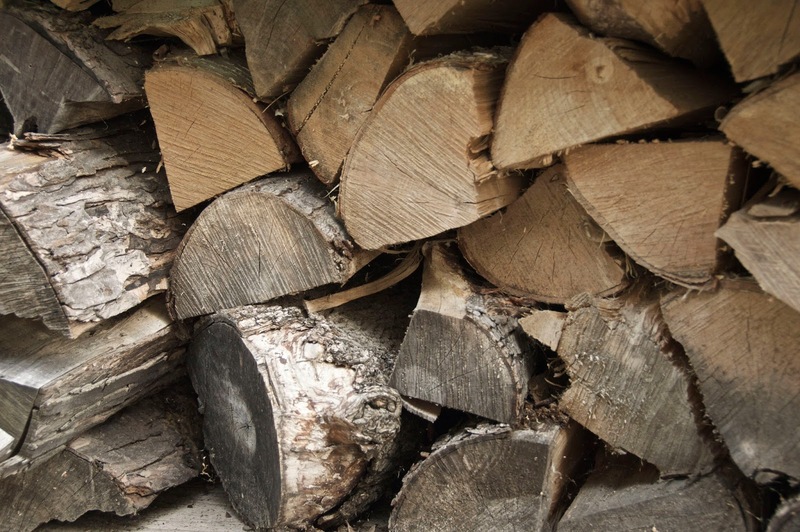 I couldn't stand to have that magnificent part of our family's history be turned into sawdust by the arborists, so I asked if we could have the logs for firewood. And maybe some crafty projects. I climbed that tree, carved it, watched my babies sleep under its hypnotizing branches dancing in the wind, posed next to it for pictures, and had my Grama wax its leaves and mail them to me in the Yukon when I was homesick. I remember helping plant that tree in our backyard shortly after moving in. Now all that's left are rings to count in a pile of logs at the side of my house. I'm sure there is some poetic metaphor to be made, but the increasing decibel of singing coming from Hailey and Robin's room has quashed all hope of inspiration.